Would you like to know how to trade divergence like a pro? I often use divergence between the MACD, stochastic, or RSI indicators and price in my own trading, according to the rules of the Top Dog Trading system and other systems. Divergence trading is crucial to many of the profitable systems that I’ve used. Learning a divergence trading strategy that works should be a top priority for any technical trader. In this article I’m going to show you what divergence is, how the pros use it to gain an edge in the market, and how you can use this information to take your trading to the next level. Divergence in trading charts is when price action differs from the action of various indicators, e.g., the MACD, stochastic oscillator, RSI, etc…. The idea is that divergence is showing decreased momentum that isn’t reflected in price yet, which could be an early indicator of a reversal. When I use the Top Dog Trading system, for instance, I’m looking for periods where price is making lower highs while the stochastic oscillator is making higher highs (bullish stochastic divergence), or where price is making higher highs while the stochastic oscillator is making lower highs (bearish stochastic divergence). I use a MACD divergence trading strategy often (MACD is the most powerful form of divergence in my experience). I don’t trade RSI divergence as often, but it can be just as powerful, as long as you have a trading strategy that utilizes it properly. In the charts below, you can see some good examples of how to trade divergence between the MACD, stochastic, and RSI indicators and price. The key, and what separates the pros from the average losing trader, is how the pros combine their divergence trading strategy with other profitable trading strategies. You can use many different kinds of supporting trading signals when you trade divergence patterns, but for the purposes of this article, we’ll be combining price action signals with our divergence signals to get high-probability entries. You can learn any of these candlestick signals in my free Price Action Course. In all of the examples I included in this article, I’ve marked the bullish divergence in green and the bearish divergence in red. The first example, MACD divergence, can occur between price and either the MACD line (blue) or the histogram (gray). In the image below, you can see a few examples of how to trade divergence on the MACD, the first of which is bullish MACD line divergence. A bullish harami pattern formed at the lower low in price while the MACD line made a double bottom. Although the harami pattern is relatively weak on its own, the combination of MACD divergence adds strength to our harami pattern, while the harami pattern provides a laser focused entry point to trade our MACD divergence from. 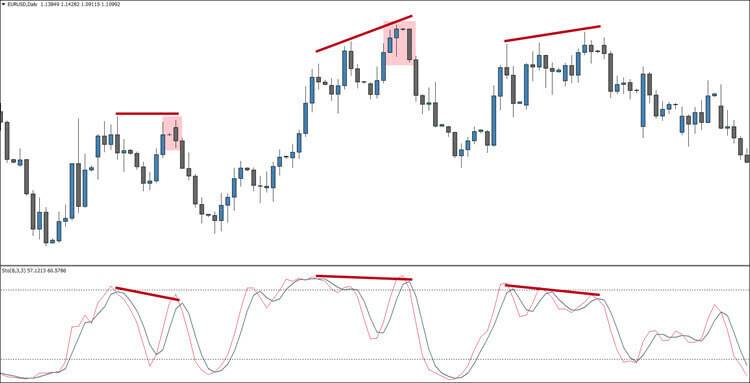 Note: For a more in-depth guide on how to trade divergence on the MACD, check out my article, Are You Trading MACD Divergence Correctly? Also, if you want to trade MACD histogram divergence, check out my article, The Best MACD Indicator for Metatrader 4 (MT4). The next two examples (above) show bearish MACD histogram divergence. First, price made a double top while the histogram made lower highs. Then, price made three consecutive higher highs while the histogram made three consecutive lower highs. In both cases, we were provided with bearish engulfing patterns to help us time our entries. In the chart above, you can see a couple of examples of how to trade divergence on the stochastic oscillator, and one example of stochastic divergence that you should skip. Most divergence traders trade stochastic divergence from the slower %D line (gray), although some divergence trading techniques, such as the “Second Chance” patterns that are taught in the Top Dog Trading course, rely on the faster %K line (red) as well. Note: The stochastic indicator pictured above is set to 8, 3, 3. Nothing else is changed. I prefer these settings when I’m using this oscillator to trade stochastic divergence. The first two examples of bearish stochastic divergence were accompanied by bearish engulfing candlestick patterns, which helps us choose a high-probability entry point. However, the last example never had a viable candlestick pattern form at the second or third high, so we would have skipped it. 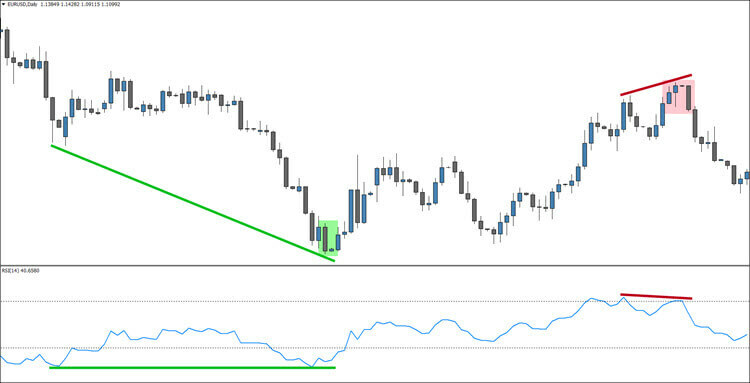 The last chart (above) shows a couple of examples of how to trade divergence on the RSI. Learning how to trade RSI divergence can be tricky. You’ll notice that the RSI line chops up and down quite a bit, so it’s not enough to base your RSI divergence trading on just any RSI highs or lows. You have to make sure that the highs or lows that you’re basing your RSI divergence off of correspond to distinguishable highs or lows in price. The same is true when you trade MACD, stochastic, or RSI divergence, but the problem is more pronounced with the RSI. The first example of divergence in the chart above is bullish RSI divergence which was accompanied by a bullish harami candlestick pattern. Then we have an example of bearish RSI divergence which was accompanied by a bearish engulfing candlestick pattern. You may or may not have noticed that all of these divergence examples are from about the same time period. Some traders like to stack these three indicators on their charts. When two or more of them are showing divergence at the same time, they can reveal some very high-probability trading entries. Learning how to trade divergence is powerful, but divergence signals should only be treated as indications of possible trading opportunities – not as buy or sell signals in and of themselves. The pros always combine other trading signals with divergence to gain an edge in the market. Successful trading is the act making better trading decisions than about 95% of other traders. That takes a profitable trading system, great psychological discipline, and impeccable money management. Learning divergence trading strategy for the MACD, stochastic, or RSI might just give you the edge you need over typical losing traders. You are the best man . What are you think about divergence with supply and demand zones ? Thanks for commenting, and thanks for the kind words. Usually, when you get a confluence of signals, the trade will have more follow through, so your confidence in the trade should increase. For instance, if you get bullish divergence at a demand zone, you should get a stronger bounce out of that demand zone. Divergence can also help you time your entries. I use divergence all the time, and I’ve found it to be pretty accurate, combined with the right trading system, for timing entries. Thanks for the kind words. I’m glad you enjoyed this. I trade divergence a lot. When trading divergence, I consider the divergence to be the key signal. I use price action to laser target my entry point. I agree that combining the two is a great strategy. Hey .. How to avoid small divergence ?? Any idea ! Hey, Willy. If you’re trading MACD divergence, you could avoid the histogram divergence and only trade MACD line divergence as it tends to be stronger. You will obviously miss out on some good trading opportunities by not using histogram divergence, and MACD line divergence happens much less often, but the setups that do happen will be stronger. 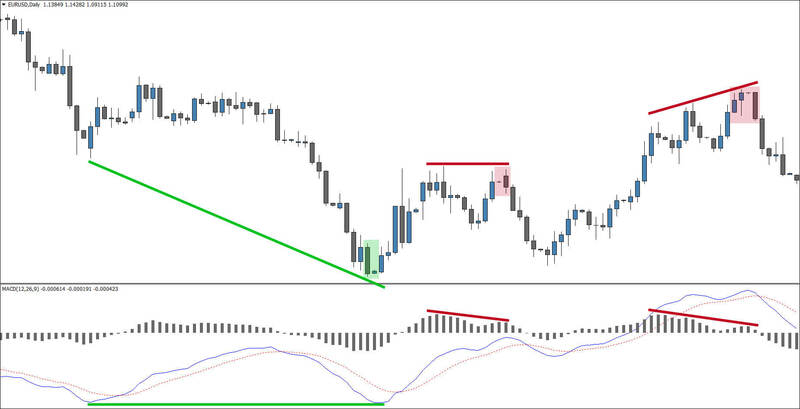 Another thing that you could do is wait for an extended trend before taking any divergence trade. In other words, divergence of any kind works better at the end of a trend. I only trade divergence after a trend has formed. How to use multiple timeframes with divergence? I’ve seen regular divergence on a 15M chart, but on 1H or 4H it won’t appear as a divergence, so what should I do and how should I prepare to trade divergence? If divergence occurs on the 15M chart, then you’re trading divergence on the 15M chart. Divergence will usually not match up on multiple time frames if that’s what you mean. If you’re saying divergence doesn’t occur on time frames other than the 15M chart, that’s simply not true. Divergence happens on every time frame. Obviously, you’ll get more opportunities on the 15M chart vs the Daily chart because there are 96 15M candles for every 1 Daily candle. I’m glad you enjoyed it. Thanks for reading and feel free to share it with other traders. All signals are more meaningful on longer time frames. However, there are advantages to trading shorter ones. You could get a divergence signal, for instance, on the 1H chart and enter a trade only to have a news release spoil the setup before the afternoon is over. When trading the shorter time frames, you typically have less time exposure to the market. You get a setup and get in and out of the market before the market tone changes too much. At least, that’s the way you want it to go.